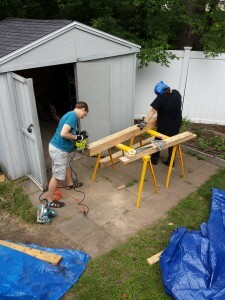 Building a tiny house in New England means anything short of a tornado is by necessity “on the table” to be a workday. Speaking of a tornado, there was one in the Boston area on Monday. While it didn’t hit our town, the accompanying storm got the best of our tarp setup and caused some water damage to one section of the sub-floor, so the plywood will now have to be replaced. Another delay. Yesterday, we had an 8am delivery from Home Depot of wood we’ll need for roofing (1/2″, 3/8″ and 3/4″ plywood, 2x4s), with light rain the whole time. Our yard is in a stage of what Owen is calling “the part of the entire building process that has the most lumber in the yard”. Hopefully this is true because space is hinting at getting tight. Nicolle came over and she, Owen and I arranged some of this wood in such a way that the completed walls were not on the trailer, so that we have room to build the Starboard wall there. Then Nicolle took inventory of already-cut wood. Notches made to this post with a circular saw and a jigsaw have to be done carefully because a mistake could require a new piece of special-order Parallam wood. Despite our New England hardiness, the rain got to us so we wrapped up work early. What seems to be the most common model for Tiny House plumbing is putting a tank on the ground floor, and using a 12-volt pump to move the water around the house (to the sink and shower). Usually the tank is in the corner of the house under the kitchen counter. This would mean running the generator any time running water was wanted, and that’s something Owen would like to avoid. The second option is building a gravity-powered water system. This would avoid using a battery-powered pump, because the water pressure would be created by THE MASS OF PLANET EARTH. But given the small size of the loft area, this would require adding a dormer to the port side to house the water tank. How exactly does new water get added to the system? We have a garden hose but where does it hook up? How often would this need to be done? And then there’s the problem of getting new water up into the tank. Hand pump? Twelve-volt pump only operated when the tank is empty? Bicycle-powered flywheel? Is there enough water pressure from a lofted tank to trigger the tankless hot water system and provide a decent shower? Is there any risk of this system freezing in winter? How can the system be built so as not to cause an overflow everytime the lofted tank is filled? Is this system tedious to use? Thoughts and opinions on this are welcome!